Chicago Personal Trainer-Author-Speaker: Read Michael’s trainer reviews and learn how his personal training clients in Chicago lost over 2500lbs! Featured on Modern Luxury's "The It List"
The answer to restructuring your life is right here! Chicago personal trainer and author Michael Moody has personally helped personal training clients collectively lose over 3,000 lbs and transform their day-to-day approach since 2005! Currently, he's completing the 2nd edition of his book Redefine Yourself and beginning a second book-a treatise on rewriting the systems/processes of your life as well as effectively integrating a "non-negotiable" mindset into goal strategy. Michael, recently named on Modern Luxury's "It List", is also known for being the fitness expert on the Biggest Loser/MSN Chicago tour and the former personal fitness trainer for The Whitney Reynolds Show on PBS). He has been featured in Muscle & Fitness and Today's Chicago Woman magazines, among others. Michael is also a Certified Fitness Nutrition Specialist, Certified Weight Loss Specialist, and Certified Senior Fitness Specialist and is producing the upcoming podcast, Redefine Yourself (a systematic analysis of change). Michael's wellness programs have set the standard for personal trainers in Chicago with his one-on-one personal training sessions and unique integration of personal fitness, nutritional guidance, and stress management...An efficient approach for small business owners, parents juggling multiple roles, and professionals in demanding industries, such as finance, accounting, advertising, and marketing. Using the experience gained from nearly 18,000 hours of one-on-one personal training sessions, Michael has truly refined the approach to fitness. As a Fitness Nutrition Specialist in Chicago, Michael truly tailors the comprehensive experience for weight loss results....guaranteed. Like Dr. Fuhrman, Michael's approach leans on natural choices without weight loss supplements (unlike most personal trainers in Chicago). The structure is adaptable, realistic, and integrative. And...yes....personal training clients can still drink a glass of wine in their diet while trying to lose weight or improving health (Don't believe it? Read the reviews from Michael's personal training clients here). Having researched emotion and coping behaviors in university-level studies, Michael has presented various fitness, motivation, body image, and stress-management programs at Illinois State University, DePaul University, corporations, high schools, and workshops. During his time as the official personal trainer for PBS's The Whitney Reynolds Show, he also produced an inspirational segment about his travels in Guatemala and was recently featured on WGN Radio. Start your transformation now by checking out Michael's resource The 99 Weight Loss, Health, and Fitness Resources I Just Sent My Personal Training Clients! 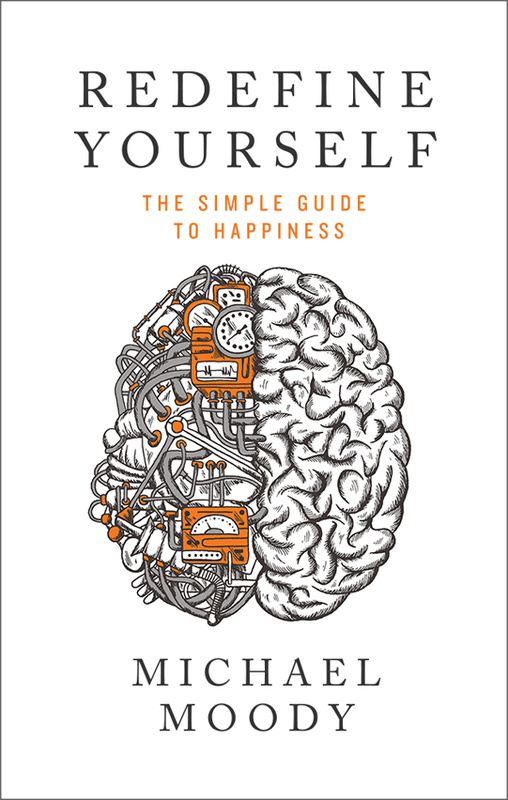 Read Michael's book Redefine Yourself: The Simple Guide to Happiness today! You will find it on Amazon, Barnes & Noble, Nook, Kindle, and more! Also, check out the "Redefine Yourself" trailer produced by Emmy winner, Dana Michelle Cook! Find Personal Training Packages for River North, Wicker Park, Bucktown, West Loop, Old Town, Lincoln Park, Gold Coast, West Town, Logan Square, and Lakeview Here! When you search the terms Personal Trainer Chicago, Personal Training Chicago, Chicago Personal Trainer, Chicago Personal Training, Find a Personal Trainer, and the many others, you'll find that the personal training experience can vary greatly among personal trainers in Chicago (for better or worse). Why is the personal training experience unique with Michael? He prides himself on an adaptive fitness approach that is efficient and results focused. Michael has personal trained professionals, brides, seniors, at-home parents, athletes, and more who live in Chicago to as far as Nigeria. His clients value personal trainers in Chicago who don't push supplements or focus on reckless fitness movements they find in magazines. As a whole, Michael not only focuses on injury rehabilitation and prevention but provides nutritional and behavioral guidelines for personal change. Michael has been my personal trainer for the past two years and have had a fantastic experience. In total, I've lost 23 pounds and have kept the weight off since beginning my work with Michael. His custom approach, attention to detail, and motivational style make him a great choice for anyone interested in living a more healthy lifestyle. In addition to fitness, Michael is an expert in nutrition; helping me take the steps to build healthy habits for the long-term. The Michael Moody Fitness Scholarship is a college scholarship of $1,500 awarded to a high school senior, undergraduate, or graduate student who has demonstrated outstanding achievement, participation and leadership in school activities and work experience, and interest in pursuing a career in the health and fitness related fields. The student may apply and use the money for education-related expenses, including tuition, fees, books, supplies, room, and board. Learn how to apply here for the 2018 year! Win a Free Personal Training Session! Please complete the following fields and submit to win a free personal training session! What issue undermines people's health the most and what steps should be taken to change it? **********Thanks for submitting your answer!